This is one of the songs on today's cd. It is actually a poem by Patrick Kavanagh put to music. It is achingly beautiful. I thought that since today was the last day of November, this would be a nice poem to post. The worst of passions pledged. I gave her the gifts of the mind. Known true Gods of Sound and Time. With word and tint I did not stint. Like the clouds over fields of May. A creature made of clay. His wings at the dawn of the day. I read the following three years ago, and found it very meaningful. I wrote to the author and asked if I might post it in my blog, and she said yes. 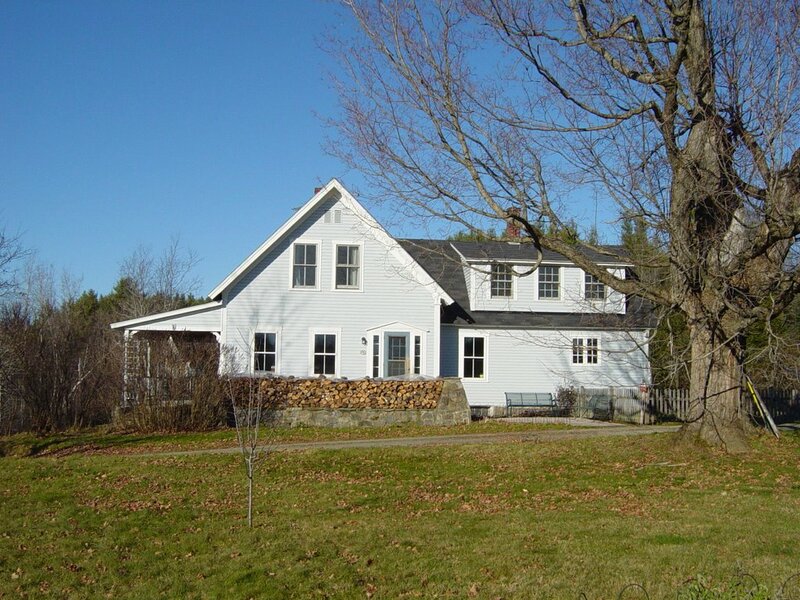 The article was written by Gail Montany, and was published in The Caledonian Record in St. Johnsbury, Vermont. I think these are words to live by, not only at Christmastime, but throughout the year. If you do choose to stay away and keep your wits intact that weekend, why not instead head to your local general store or arts/crafts shop or clothing boutique to do some shopping? In fact, why not eschew non-local Christmas shopping altogether? Look at it this way. When you purchase a gift from a locally owned independent business (also known as a LOIB), those dollars stay right in your own community. Each dollar spent on a LOIB multiplies itself at least five times in the community as those dollars in turn are spent on employee wages, supplies purchased from other local businesses, contributions to nonprofit organizations, the town's tax coffers for school funding, etc. ; in other words, those dollars are building a strong local economy. On the other hand, if you choose to spend your money at a down-country mall, big box store, chain-clothing clone or online behemoth, you're pouring your money into the economy of another community at best, and enriching some already grossly overpaid CEOs at worst. Your hometown LOIBs offer an array of great gift ideas in all price ranges that your recipient will be just as thrilled to receive as they would if the gift had been bought at a box chain (probably more). Use your imagination! Gift certificates to a local restaurant or movie theater are perfect for impossible-to-buy-for friends. 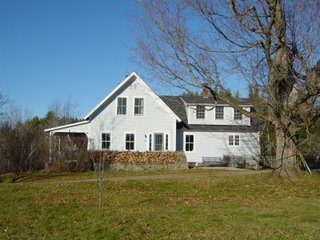 How about a stay at a local B&B, or a certificate for a massage or pedicure for someone who needs some personal pampering? Just about every town has a general store chock-full of cool and unusual stuff; bookstores are an excellent source of inspiration, as are art cooperatives and specialty boutiques. If you habitually shop out of town, make it a goal this year to buy, say, three gifts at a locally owned independent business in your or a nearby town. 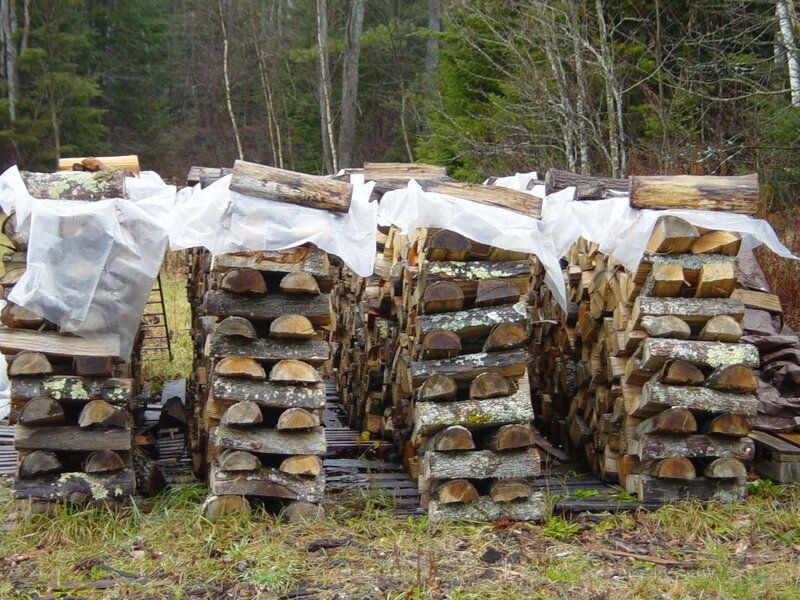 It'll be good for your community - and for you. This morning I read a blog review of a Joan Baez concert in which she sang Carrickfergus. 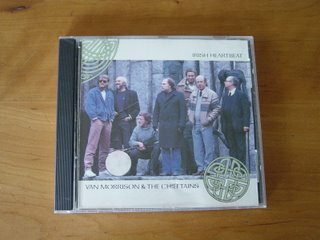 I got right up from the computer and put on today's cd. This is one of the most beautiful, yet saddest, songs I've ever heard. 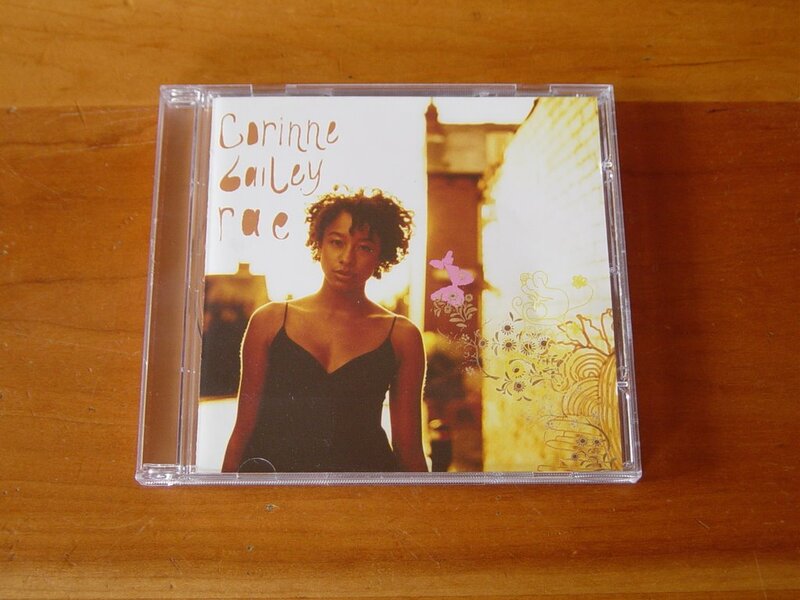 A while back, a local radio station asked for submissions of listeners' top ten albums, and this one was on my list. It is nearly 20 years old, and I have listened to it innumerable times. Every song is perfect. I'm sorry that Radio blog club didn't have a working version of any of the songs. What incredible beauty from a $5 bulb! I often see these around Christmastime, but with red flowers. I am very fond of pastel colors, so I thought I'd try this one, and am really pleased with the result. 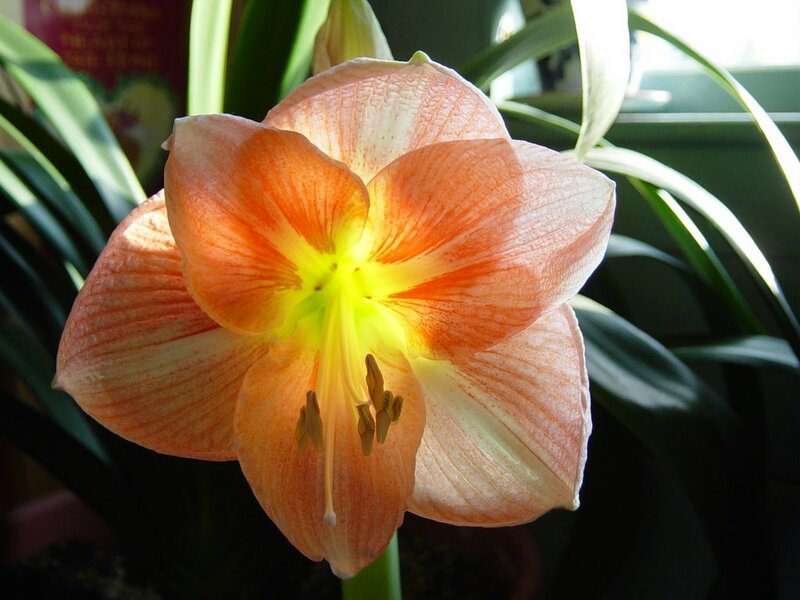 The botanical name for the plant, according to the late James Crockett, is Hippeastrum, which means horse star. The plant originates in South Africa, as does another plant in my home, the clivia. They both produce dramatically beautiful flowers during a season when no flowers bloom outdoors. 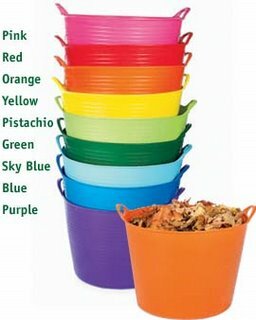 I keep my cleaning supplies in one, the daily wood for the woodstove in another, my plastic storage containers in a third, and just yesterday I got my Christmas books out of the Christmas closet, and put them in my fourth tub. Since most of them are children's books, they set me dreaming about the days when my kids were little. What lovely, lovely times of snuggling close together on the couch reading these stories of Christmas, in the glow of the Christmas tree lights. I think what I'll try to do is spotlight some of them during the month of December. I love every song on the wonderful cd. The song playing is arguably the most familiar, Put Your Records On. I'm delighted by the Bob Marley reference in the first line: "three little birds sat on my window and they told me I don't need to worry". 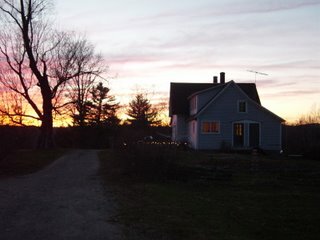 It was nearly dark, for the full November twilight had fallen around Green Gables, and the only light in the kitchen came from the dancing red flames in the stove. Anne was curled up Turk-fashion on the hearthrug, gazing into that joyous glow where the sunshine of a hundred summers was being distilled from the maple cordwood. 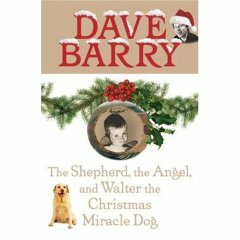 My November book of the month is The Shepherd, the Angel, and Walter the Christmas Miracle Dog, a new book of fiction by Dave Barry. Now, I rarely read Dave Barry's columns, and have never read one of his books. I picked this book up at the library for my husband, thinking he would like it. He read it in one sitting, and thought it was great. He laughed out loud and read several passages to me, and said I really should read it. Well, I just loved it! I bought it for our Christmas book collection, and now my husband is reading it aloud to his junior high students. I was about the same age as the main character in the early 1960s, so everything was familiar to me. He had some terrific, evocative drawings and photographs of the period interspersed throughout the book. It was very funny, very warm-hearted, and simply lovely. I gave it an A+ in my book journal. The song playing is Cosy in the Rocket by Psapp, the original theme music for the show. I was introduced to many new artists through this soundtrack. 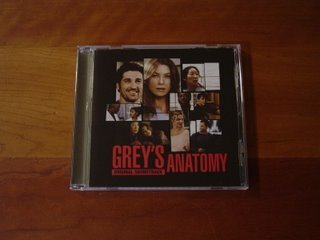 I'm also getting the season 2 cd. 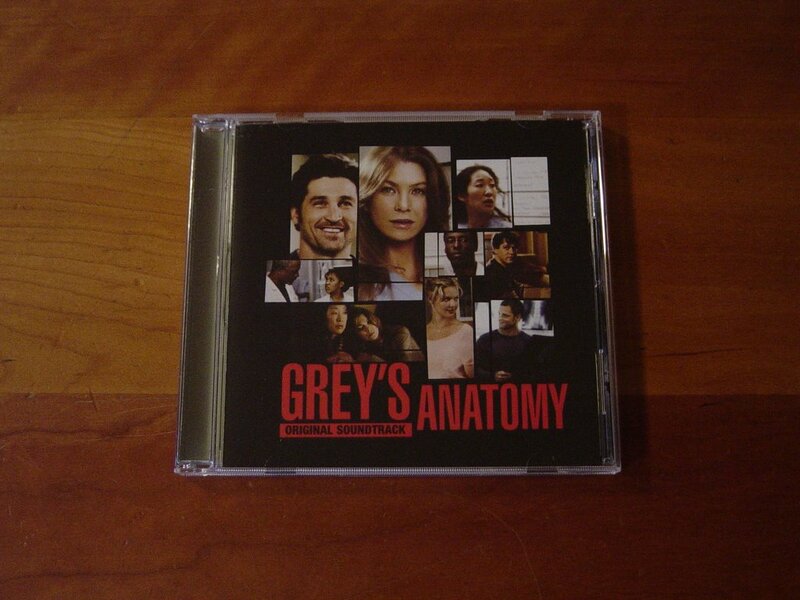 I love Grey's Anatomy, the show and the music! I was visiting a blog called biblio files, and saw music on her site. When I clicked, I could listen to Elvis Costello, or any of several others while I read her blog. I wrote and asked her how to do it, and she wrote back with all the info. It is a site called radio blog club. I did a search and found Feist, and added one of their songs to my Today's cd post. What a wonder! I can't believe how great this is. Now each time I post a cd cover, I'll put the music in the same post so you can hear for yourself. I'm shaking my head in amazement. 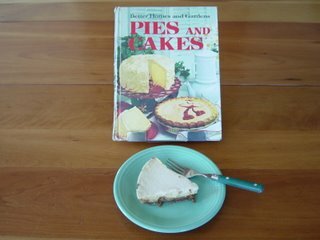 For this year's Thanksgiving dessert, I made an old favorite called Speedy Cheesecake Pie. The recipe comes from my late mother's 1966 cookbook. Beat cream cheese until fluffy. Gradually blend in 1/2 cup sugar, lemon juice, 1/2 teaspoon vanilla, and salt. Add eggs, and beat well. Pour filling into crust and bake in a slow oven, 325º F. for 25-30 minutes or until set. 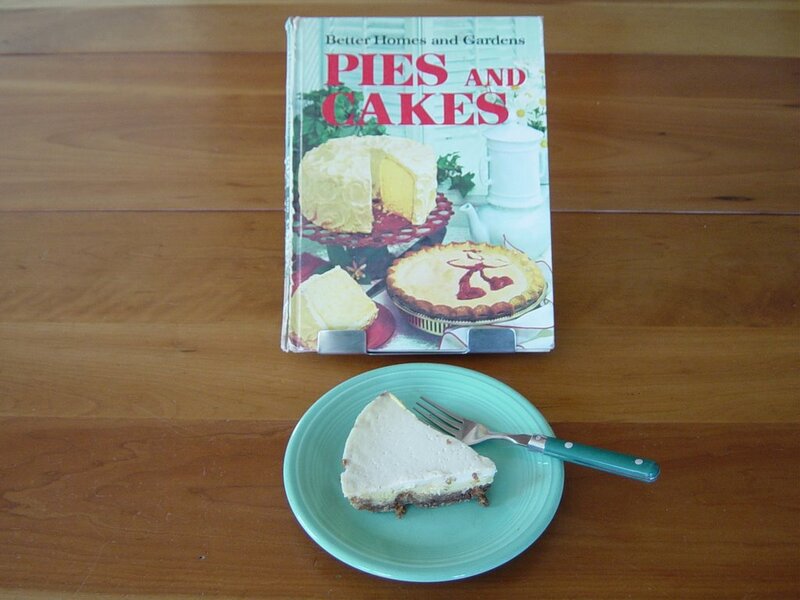 Combine sour cream, 2 Tablespoons sugar, and 1/2 teaspoon vanilla and spoon over top of pie. Bake 10 minutes longer. Cool. Chill several hours. This easy cheesecake is truly the best I've ever eaten, and my family agrees. You can buy a pre-made crust, or make one with graham crackers, sugar, and butter. The recipe is usually on the box. "You never really got to know people properly until you had seen them within the ambiance of their own home. Seen their furniture and their books and the manner of their life-style." Well, here is a little glimpse into my house. We recently rearranged our study so the computer table sits in a corner, looking out into the room. 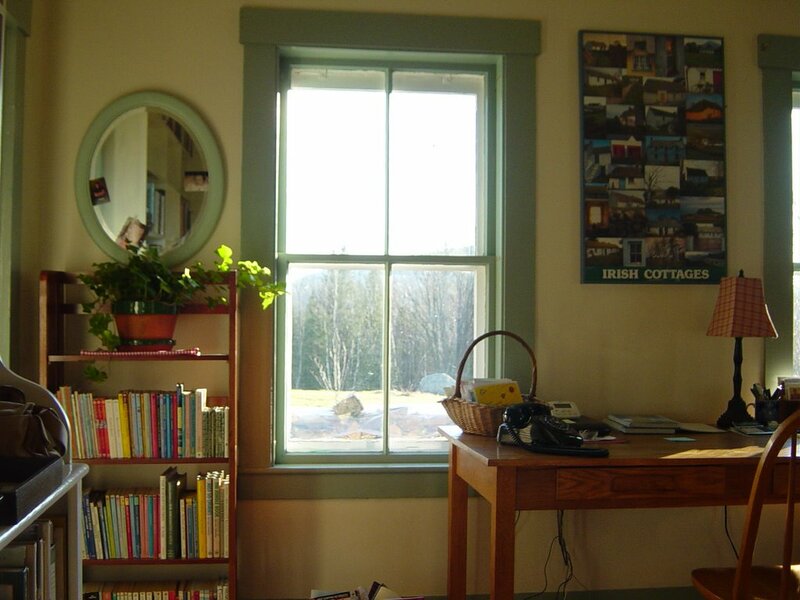 I like glancing up and looking out the windows for refreshment and inspiration. 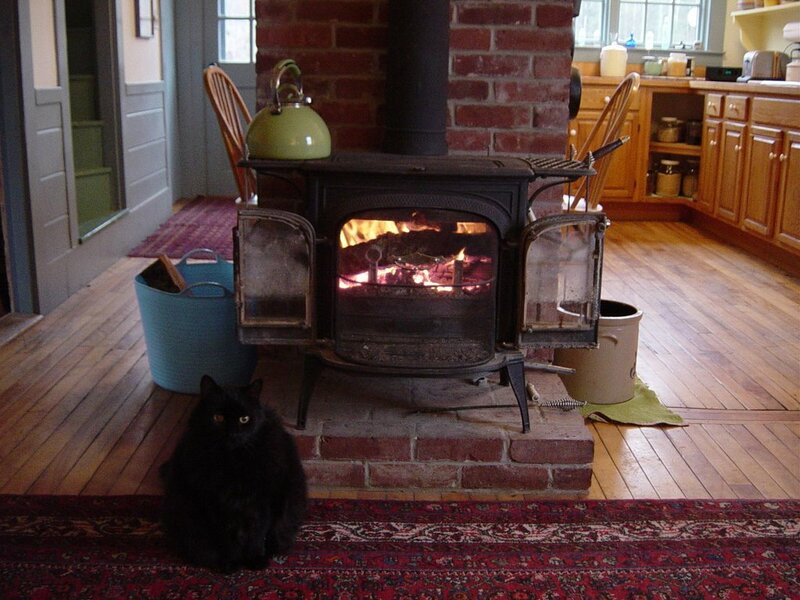 I have an interest in feng shui and seem to have a natural affinity for it. The "feel" of a room, of a home, even a business is very important to me. Well, not this year! We have had many warm days, and many sunny days. Today it is quite cold, but as you can see it is gloriously bright. Actually, I am a big fan of November. This is the month when the landscape opens up. We can see lights in the distance which were hidden throughout the summer. I'm sure that in past times, the families who lived on these isolated hill farms were happy to see the neighboring lights. When there wasn’t easy communication between people even a mile away, they must have brought great comfort in the winter season. I’ve discovered nests that I didn’t even know were there. How did I miss the building of those summer homes? Were there so many noises of summer that I never heard the little ones peeping for food? Why didn’t I see those babies as they began to leave the nest? The deer who were in the woods all summer come out to browse what is left in my vegetable garden, and I whisper a little prayer that they will be spared the hunters’ bullets.